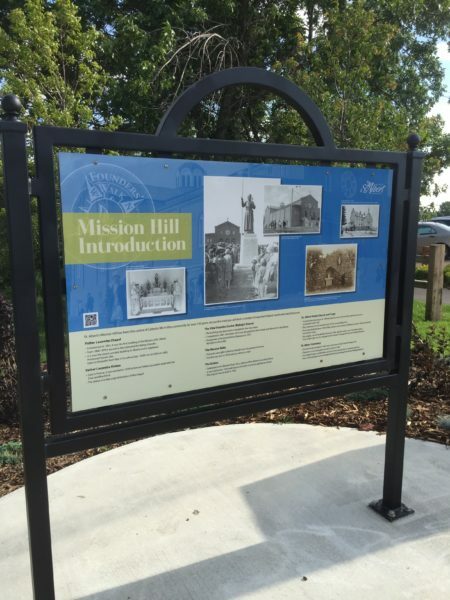 • Constructed in 1861, it was the first building of the Mission of St. Albert. • From 1868-1870 it served as the Cathedral for Bishop Grandin. • It is now the oldest wooden building in Alberta and a registered Provincial Historic Site. Open to the public from May 15 to Labour Day – 10:00 a.m. to 5:00 p.m. daily. 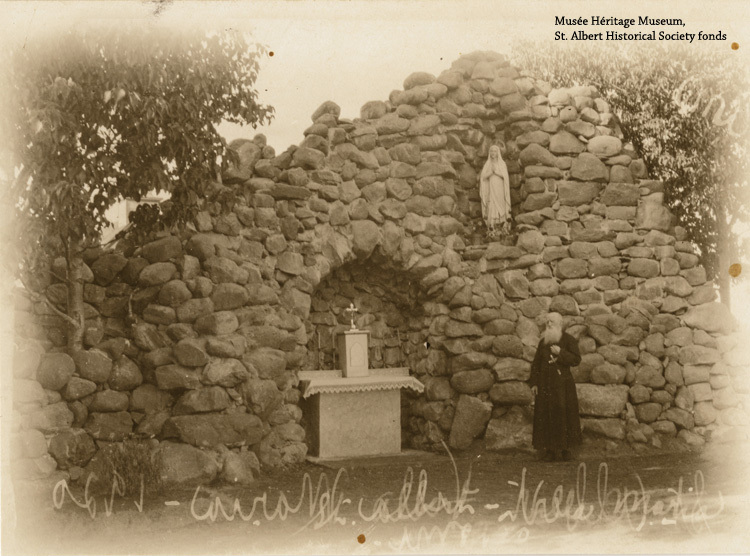 • The statue is in the original location of the chapel. • The building was planned as a hospital for the Grey Nuns. • Completed in 1887, the Sisters felt it was too grand for their needs and offered it to the Bishop. • Designated a Provincial Historic Site in 1977. • The bells were gifts to Bishop Grandin from his Patrons in France. • The first was sent in 1874 and two others in 1887. • Dedicated to the Blessed Virgin it is a replica of the shrine in Lourdes France. • It was built in the 1920s with stones from the riverbank and farmers’ fields. 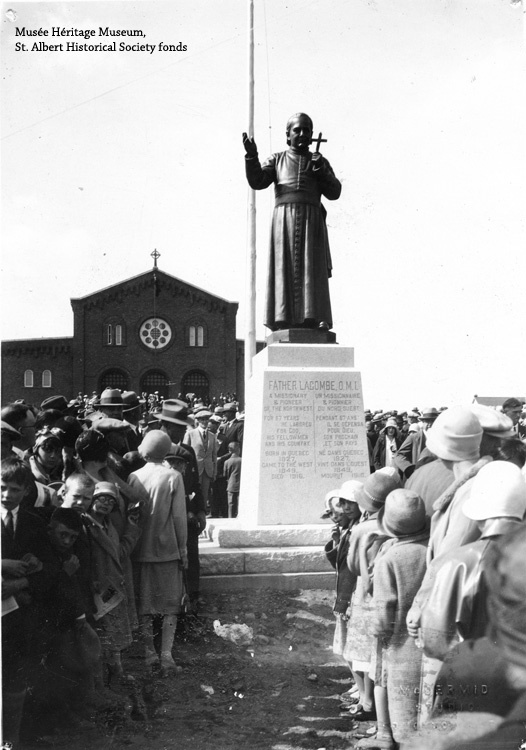 Lacombe statue unveiling, Sep. 21, 1929. • Construction was begun in 1900 but due to a lack of funds the main level was not completed until 1922. • The 1,000 seat church served much of the surrounding area. • The Crypt, built between 1900-1906, contains the remains of Bishop Grandin, Father Lacombe and Father Leduc. • Two angels, carved by Brother Brochart, OMI, stand in watch over the three tombs. Tours of the Crypt can be arranged at the Chapel or through the Musée Héritage Museum. • The first burial recorded in 1861 was a ten-year-old girl named Marguerite. • There are no surviving grave markers prior to 1890. • The Oblate Priests and Brothers, and Grey Nuns are buried in separate sections. Tours of the cemetery can be arranged at the Chapel or through the Musée Héritage Museum.